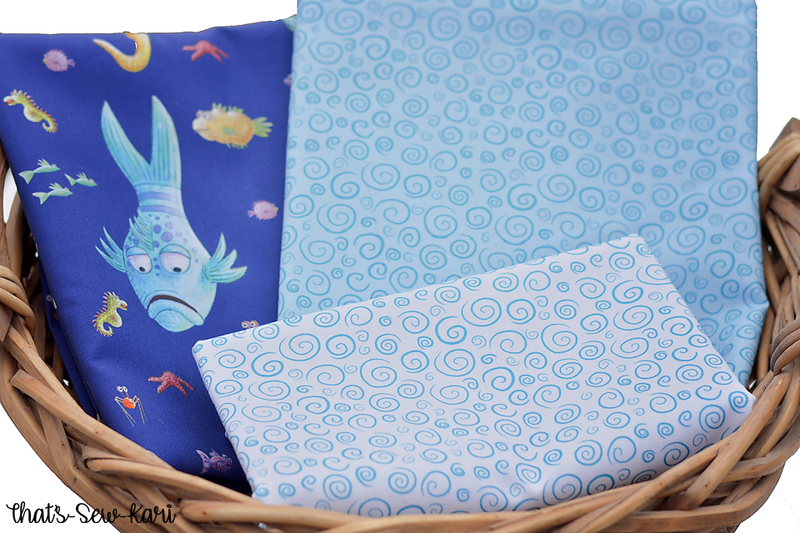 I am super excited to share the Pout-Pout Fish Fabric Collection now at Riley Blake Designs!! Not only does my youngest daughter love fish, but as a Pre-K teacher, I love the Pout-Pout books! 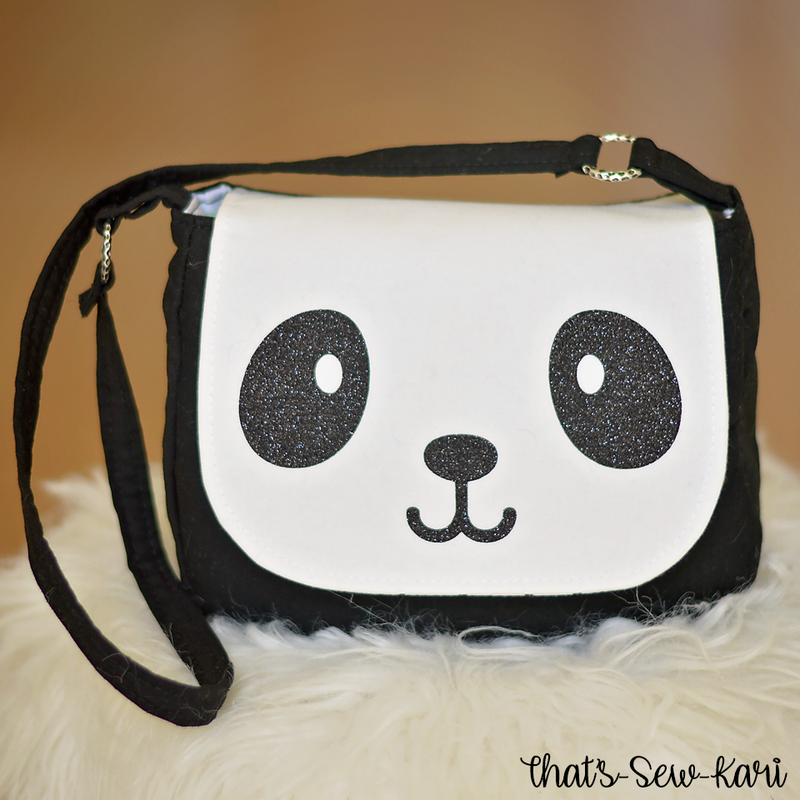 This collection is SO super cute! The collection comes in 3 colorways - white, aqua and blue - and also has a panel option, soft alphabet book (that I almost requested to sew for my classroom) and a quilt kit! 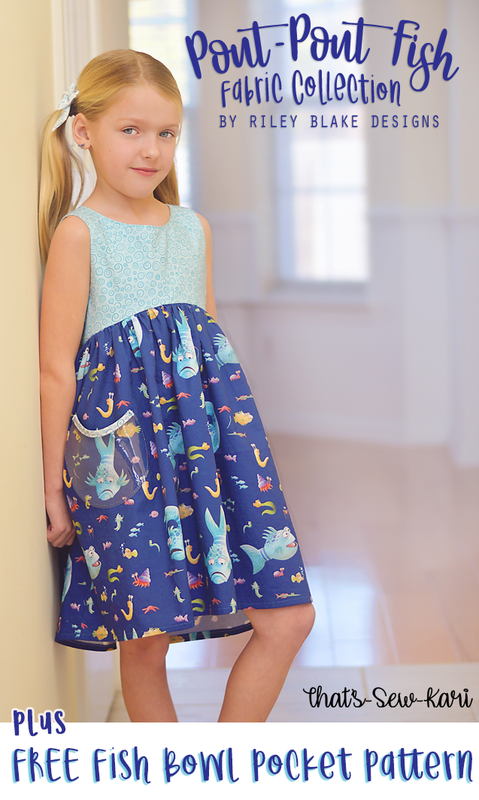 When my daughter and I browsed the fabrics on Riley Blake Designs' website, she fell in love with the Pout-Pout Fish Main print in Blue. 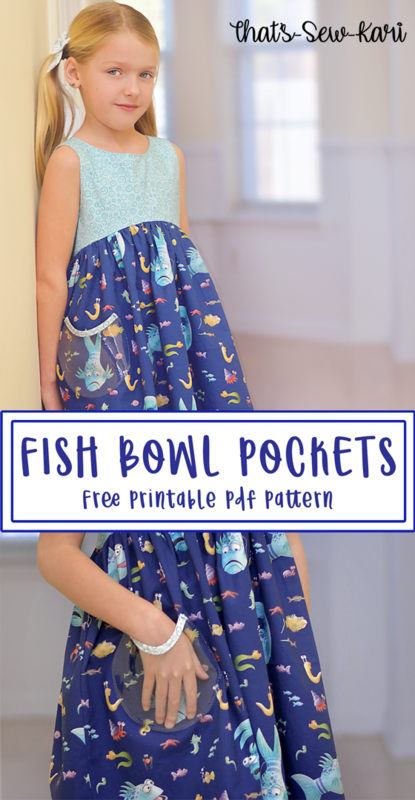 Without wanting to go full-blown costume-y, we chose a pattern with a curved bodice to give a nod to Pout-Pout's infamous frown. Then, half jokingly, I told my daughter we should add a plastic pocket over Pout-Pout like he's in a fish bowl. Well.... of course, she never forgot my suggestion (because kids never do). She asked daily if I had her Pout-Pout dress done and if I had made a fish bowl pocket for him. Ummm, I was sort of joking! HA!! So off to Walmart we went to look for plastic vinyl. Then I got to work! It was so super easy, I just had to share it will all of you. 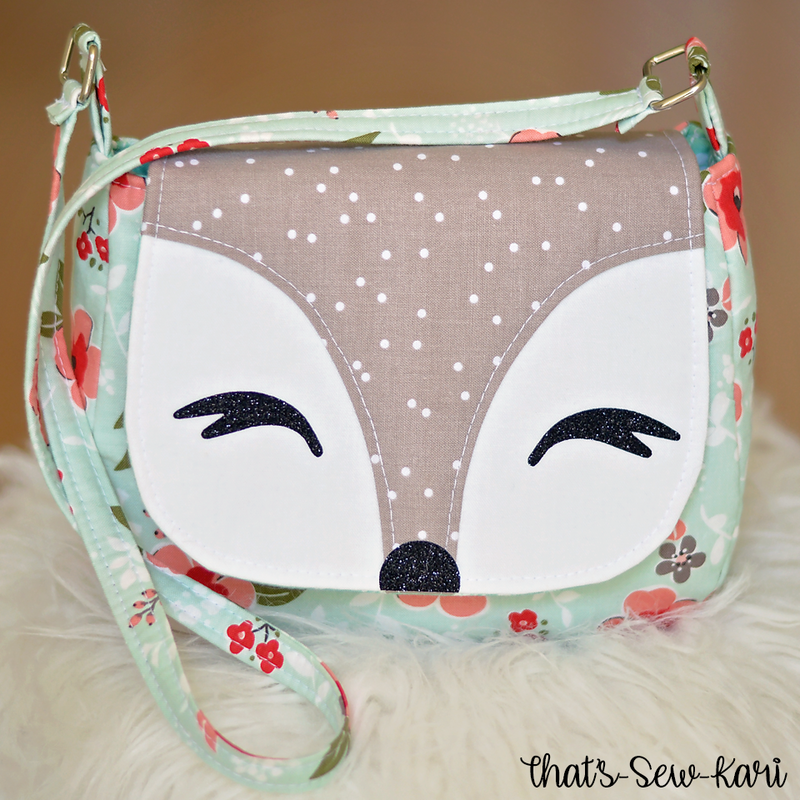 Download the FREE pattern by clicking the button below. Save it to your computer and then open it using Adobe Acrobat Reader DC. Print it out at 100% scaling. Verify that the 1" square is accurate. Cut out 1 pocket from clear mid-weight plastic vinyl. Unfold the bias tape and fold each end under by 1/4". Keep unfolded except for the ends. With the end folded under, place the right side of the bias against the top edge of the back side of the pocket. Sew along the first crease. Refold the bias tape and bring it up and over the front. 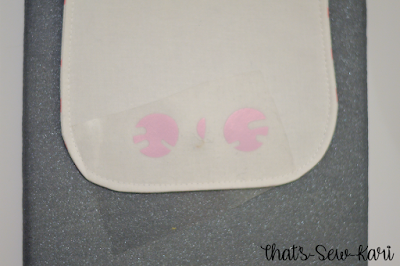 Using wonder clips (not pins), hold in place and topstitch 1/8" from bottom edge of your bias tape. The top of your pocket is now enclosed. Place pocket on skirt where desired. (Do not use pins to hold in place). Sew along the length of the pocket along the outer edge. To get the rounded fish bowl effect, do not sew it on flat. Instead, place the top edges a bit closer together.. Be sure to backstitch a few times at the beginning and the end so your pocket stays secure. 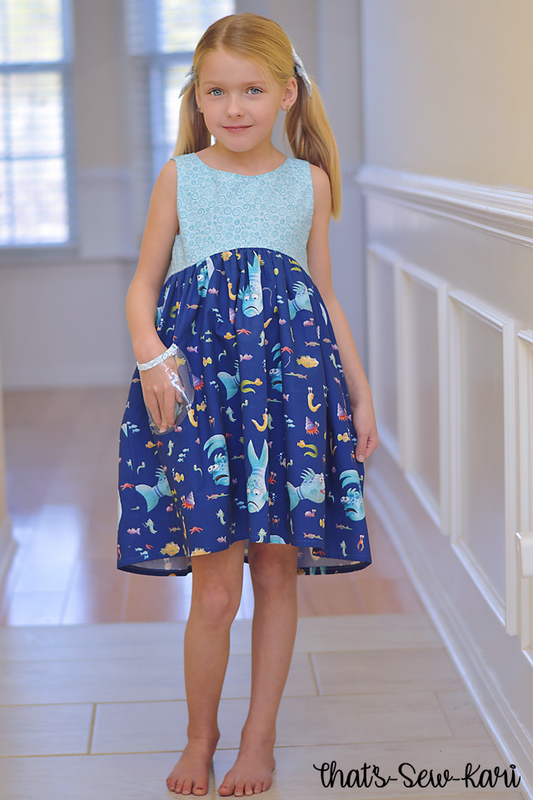 The dress pattern I used is Bristol by Little Lizard King. I made it sleeveless because that's what she loves! 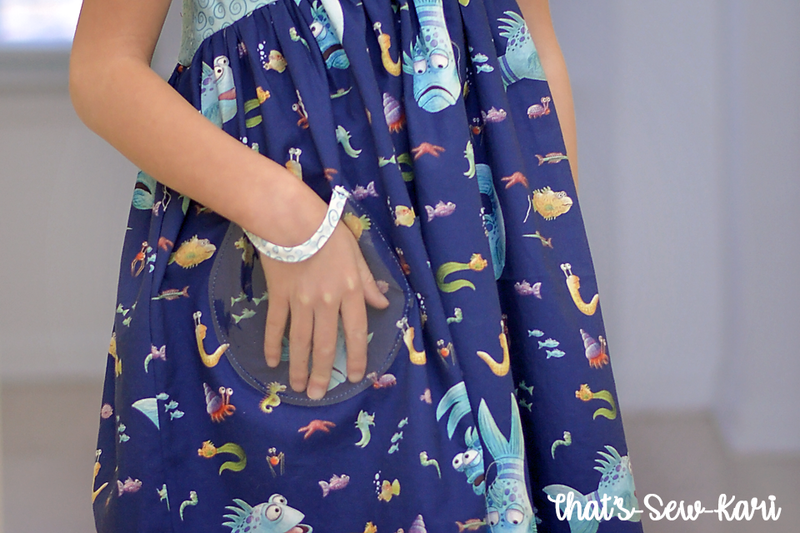 For the bodice, I used the Pout-Pout Fish Swirls in Aqua and lined it with Pout-Pout Fish Swirls in White. 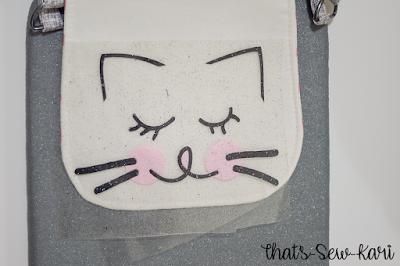 I also used the white as the rim of my fish bowl pocket (the bias tape in the tutorial above). 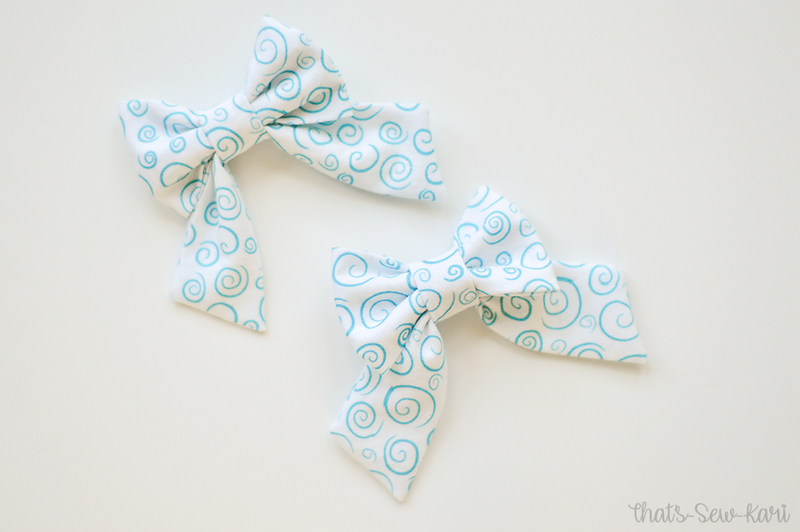 I also used some of the Pout-Pout Fish Swirls in White for some piggy-tail bows. Sweet Red Poppy just came out with this super easy pattern, including cut files for the Cricut Maker!! The Sailor Bow Pattern comes in 4 sizes. This is the mini size. 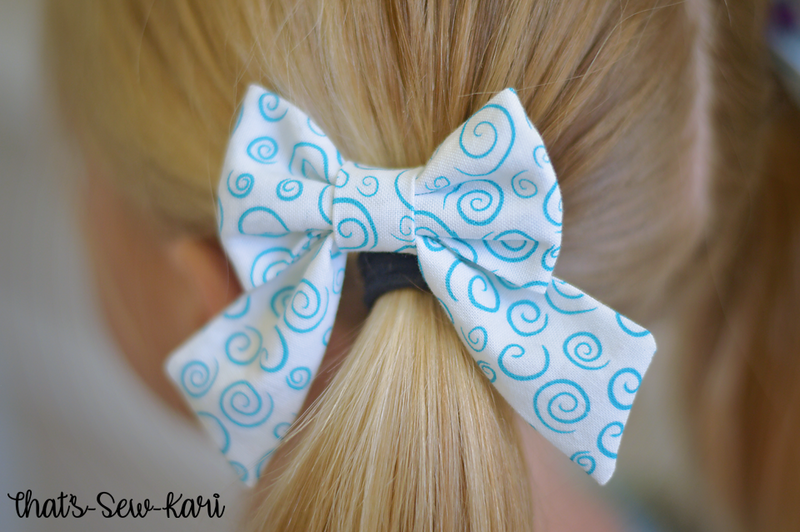 Grab the Sailor bow pattern here! 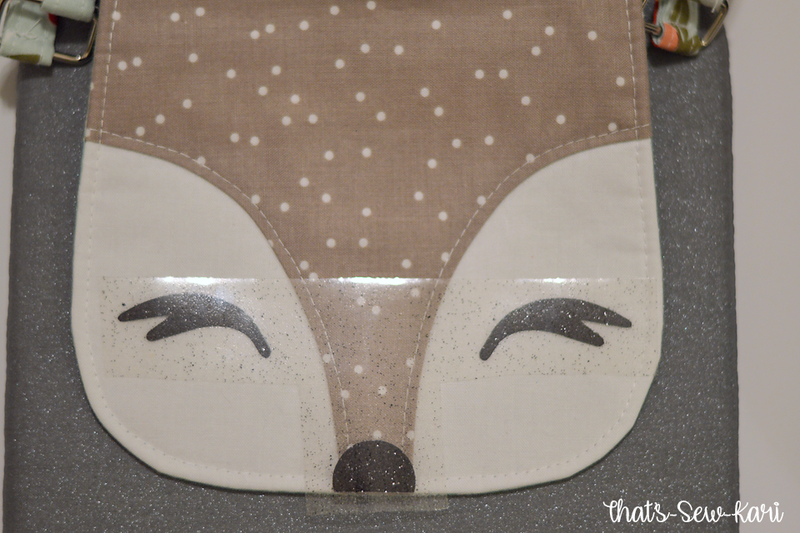 Thank you Riley Blake Designs for the cute fabric!! It really sparked my creative juices. 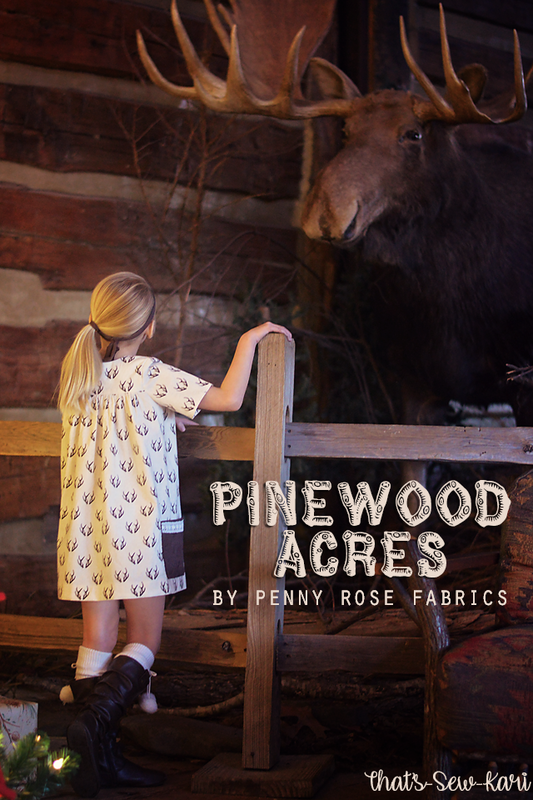 Penny Rose Fabrics has just released a new line called Pinewood Acres and it's full of all things outdoorsy and rustic. Now, I know what you're thinking.... 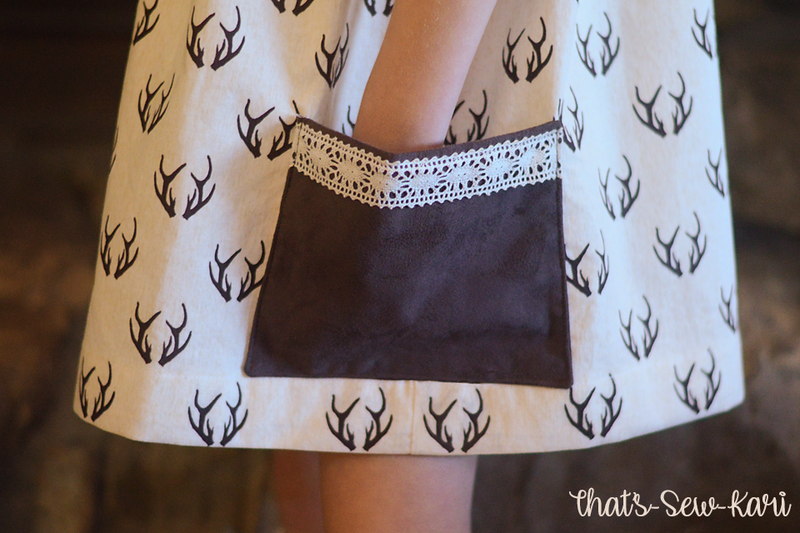 I'm neither rustic nor outdoorsy, but then I saw these cute deer antlers and thought they were so cute and could be transformed into a chic little winter dress. 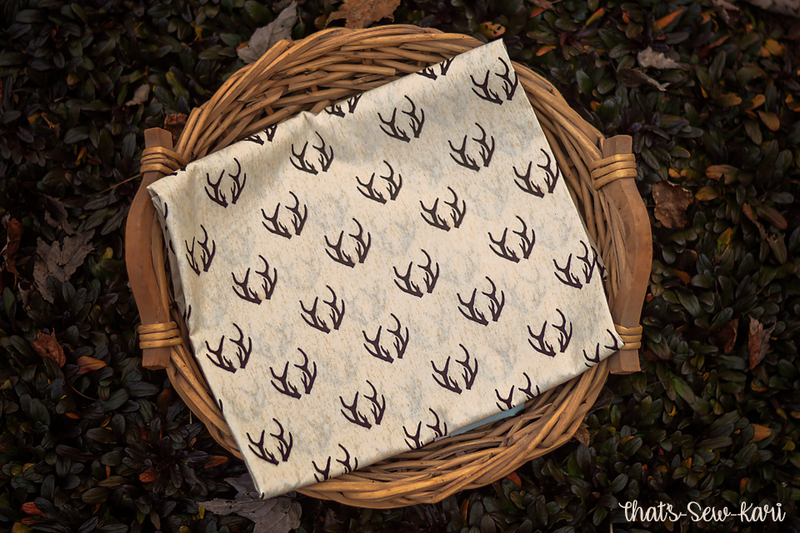 I chose Pinewood Acres Antlers in Cream. Y'all, we headed to Bass Pro Shop. They have a gorgeous lobby that they decorate for Christmas. I sewed Napoli by Little Lizard King. It's a classic babydoll bodice, fully functioning buttons (so she can do it all by herself!) and a vintage length, which really suits her. The cotton woven helps keep the shape of the silhouette (as opposed to my rayon version here). The repeat of the pattern made it easy to match across the placket (which makes my heart happy!). I know some people shy away from buttonholes, but I just have to give a little shoutout to my Singer Quantum Stylist. I created 7 perfect buttonholes in about 4 minutes time! I couldn't resist adding pockets. 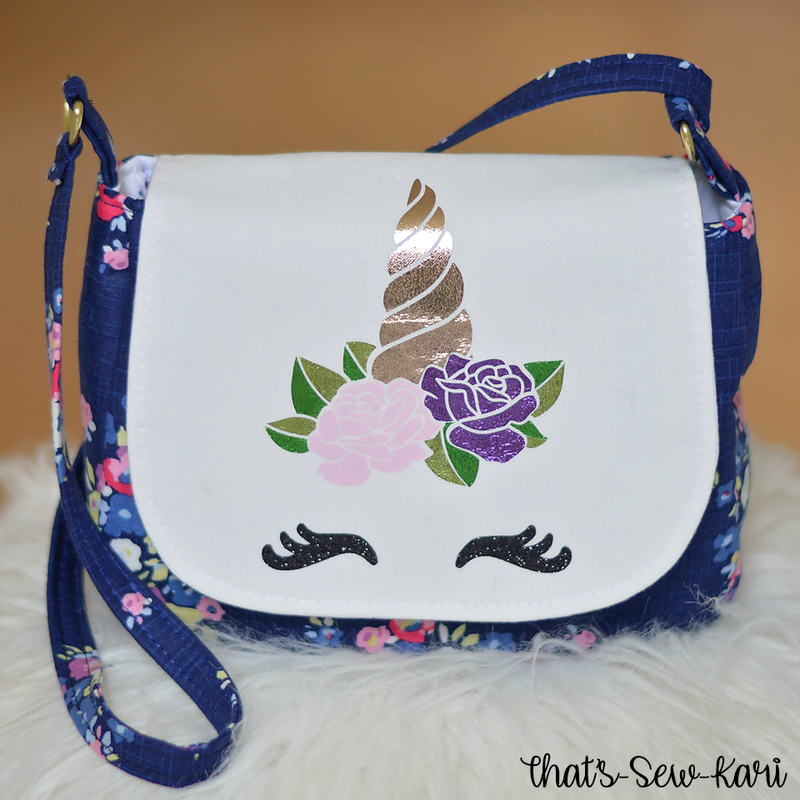 These were self-drafted (quite literally just eye-balled it...lol). I added them last minute, but I'm so glad I did! I wish I'd had the foresight of pockets because I would have ordered Pinewood Acres Grain in Brown. Instead, I grabbed some brown quilting cotton (for structure) and dark brown micro-suede and then added some cream lace. I hope you've been inspired to step outside of your comfort zone! 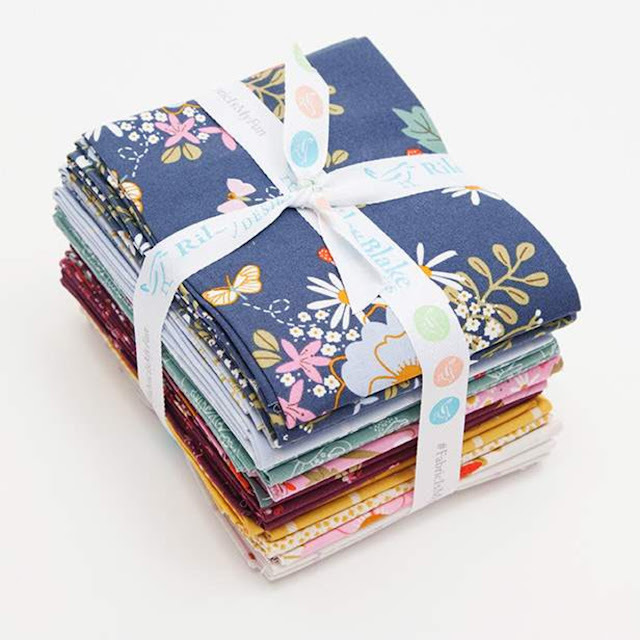 Thank you Penny Rose Fabrics and Riley Blake Designs for the fabric!! My girls always wonder who the next package of happy mail is for!! #1 It's extremely user friendly! 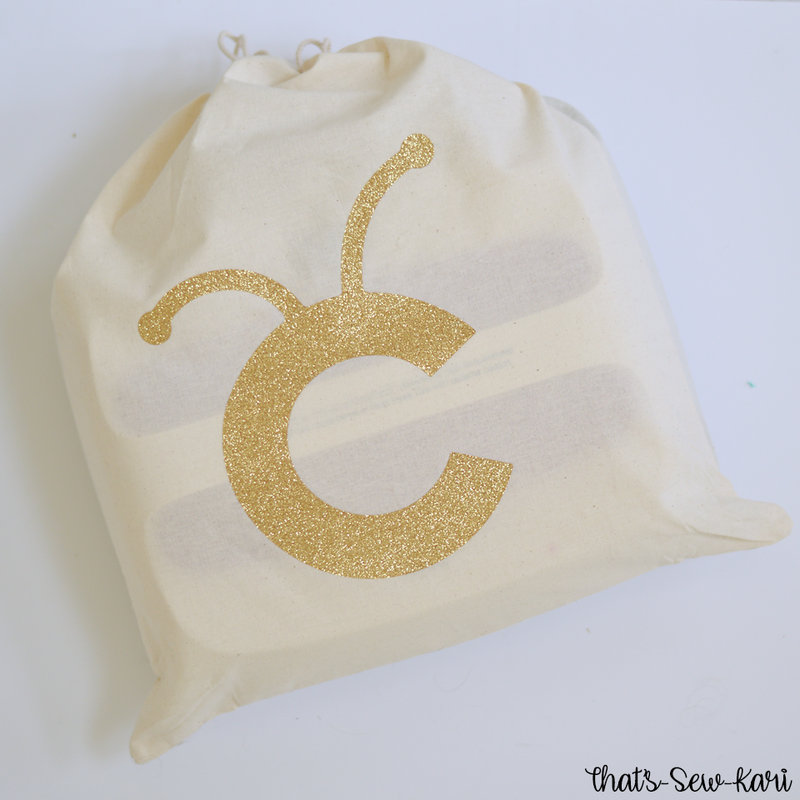 Cricut has done the best job of taking the guesswork out of crafting! There is no guessing as to whether you are using the right temperature or pressing for the correct amount of time. With only a few buttons to set the temperature and time, there's no learning curve. Be sure to bookmark their INTERACTIVE PRESSING GUIDE and with a few bits of information you input, a step-by-step guide with appear, complete with pressing temperature and time. 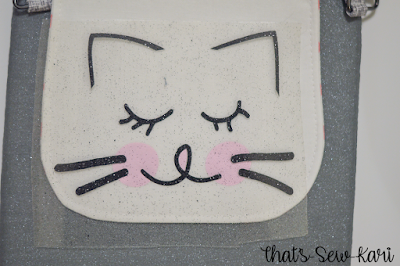 Cricut also sends you a sample project for you to practice with before you use the EasyPress 2 on your own materials. Here is the finished Sample Project! Craft night with the girls? 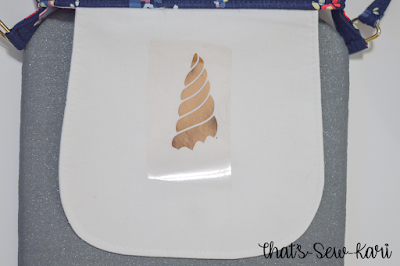 Headed on vacation but want to do some iron-on in your downtime? The EasyPress 2 is lightweight and transports easily. Remember the sample project? It doubles as a carrying case!! It fits perfectly inside -- including the base!! I had a "pressing" party with a co-worker of mine when we made t-shirts for the staff for a "Pink Out" Day for breast cancer. She has a heat press, but was way too bulky to bring to school. I packed up both my mini EasyPress2 and my large EasyPress 2 and we each had one to use! It heats up quickly, with the mini heating up to the maximum temperature in under 60 seconds. The largest heats up to the maximum temperature in under 3 minutes which is a fraction of the time it takes a heat press to heat up. #4 It has an even heating plate. 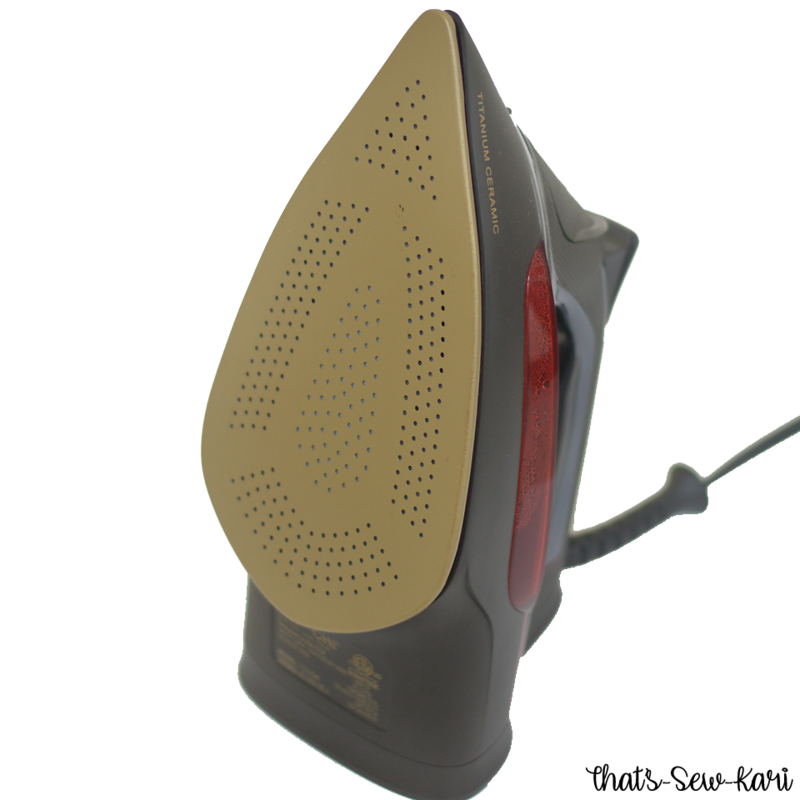 Ordinary irons aren't always even temperatures and of course, has steam holes throughout the base. 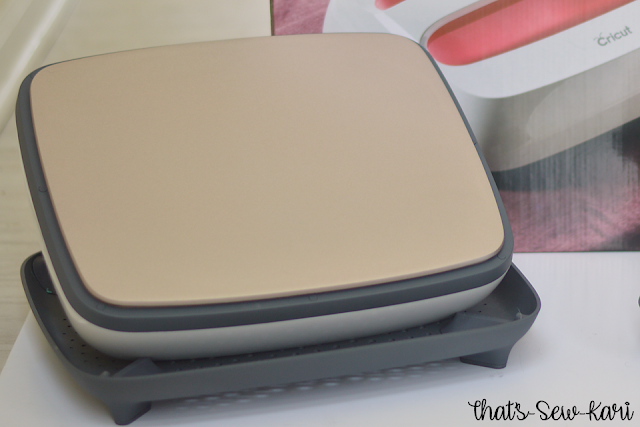 The EasyPress 2 has a ceramic-coated surface and two heating elements for edge-to-edge heat. Also, there's no chance of accidentally leaving the steam on. #5 It has a built-in timer. 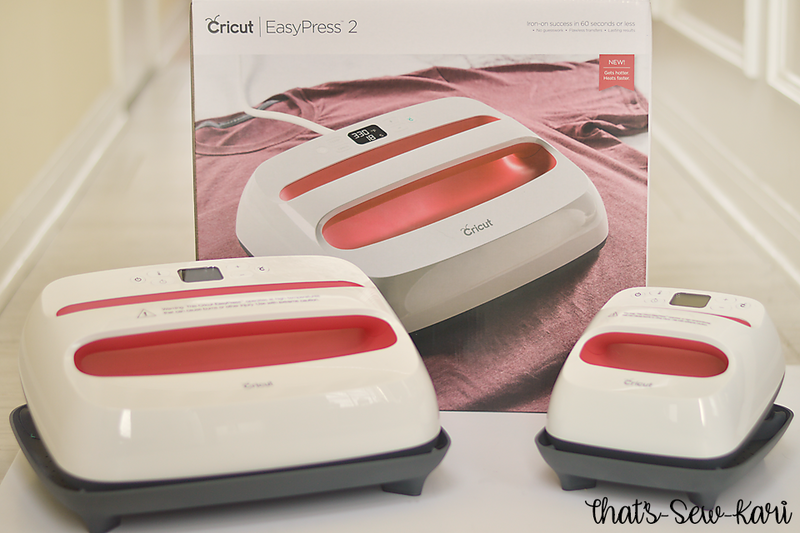 With the push of a button, you can have the EasyPress 2 count for you. 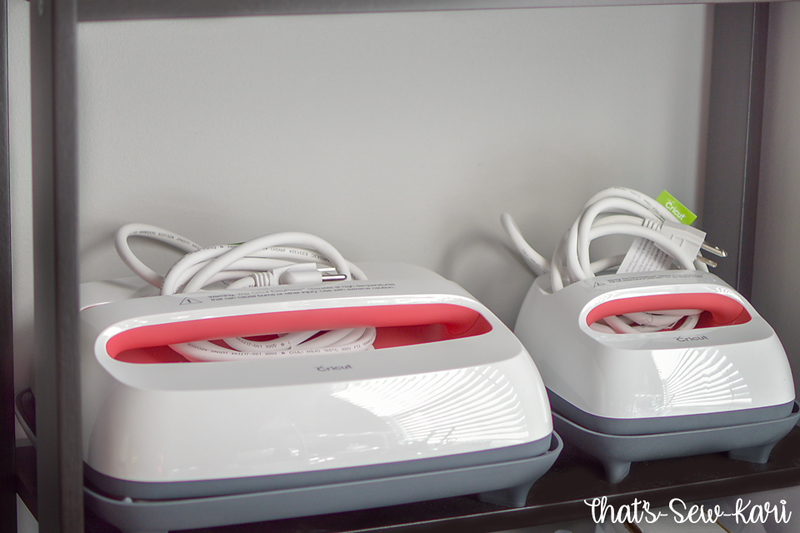 I can't tell you how many times that I'd be counting in my head with my regular iron and I'd probably only press for a fraction of the time I actually needed to. With my EP2, I press Start and don't have to worry about it! 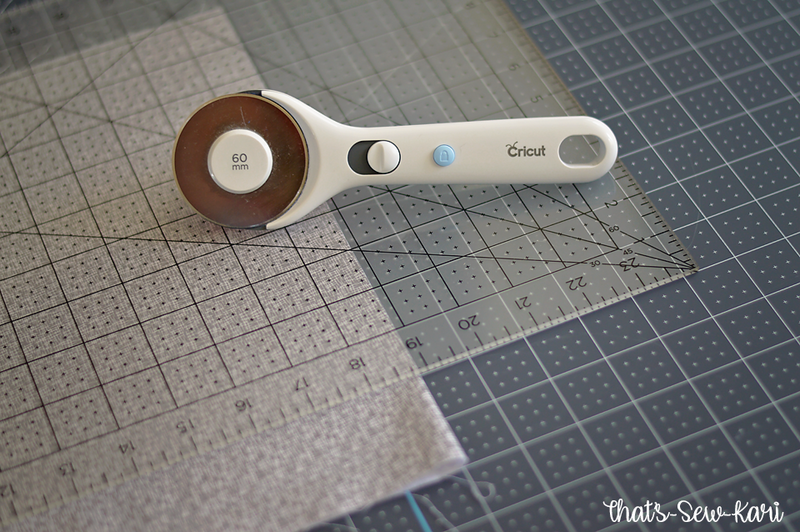 I can't be the only crafter out there without a dedicated sewing/crafting room. In fact, my crafting corner is literally 3 feet from my bed. Space is limited so my items need to be able to fit on my shelf by my sewing desk. With the EasyPress 2 base to protect your surface, you can craft where you can! For my blog posts, I can take pictures easier if I craft on the floor (because I'm super short...lol). I've successfully used my EasyPress 2 on the wood floor without issue! (Make sure the kids aren't around if you have it on the floor). 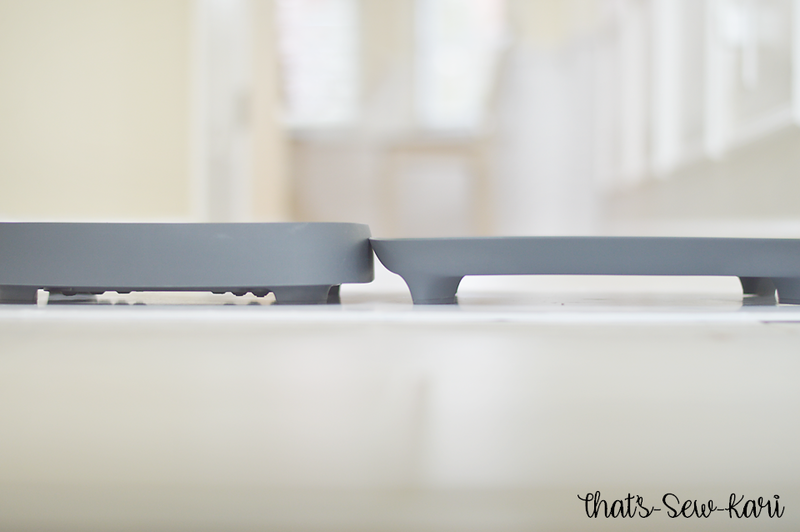 The base has been improved from the original Easy Press to keep your surface 60% cooler. Here's a side by side view of both bases. 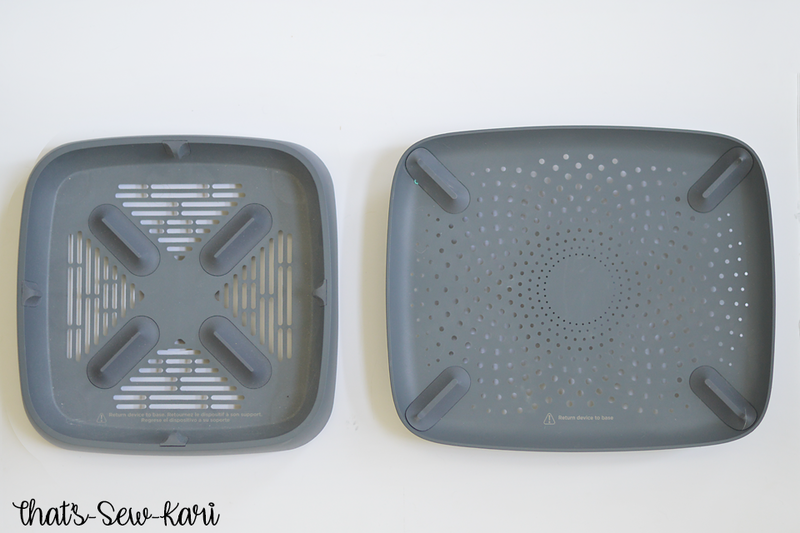 Base comparison: Left is Original EasyPress, Right is EasyPress 2. Notice how much higher the new one sits off the ground! Side by side comparison (top view) Left is Original Easy Press, Right is EasyPress 2. Notice the holes are much smaller on the new design. #8 You get to pick your size! #9 More temperatures, more possibilites! The Original EasyPress heats to just 350F while the EasyPress 2 heats to 400F. It also supports a bigger range of materials! Nothing is more frustrating than to buy something only to have a newer item release shortly after with updated firmware. 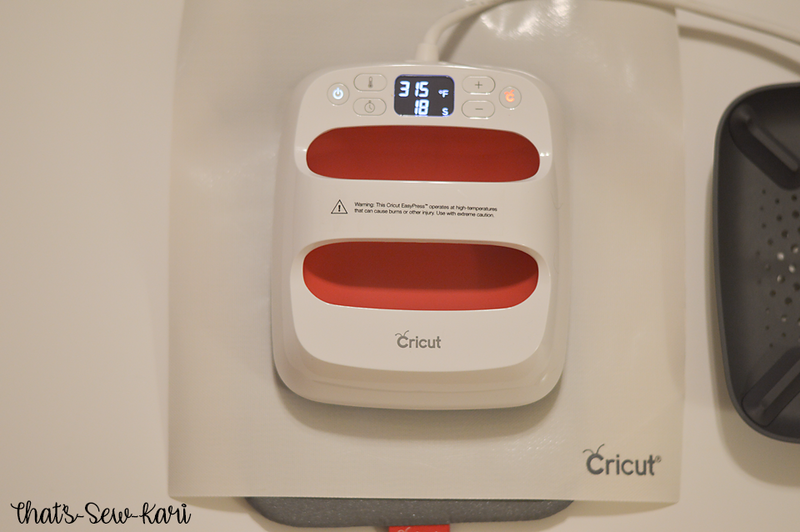 Cricut has included a mini USB port to be able to update the firmware on the EasyPress 2! Y'all, it's here... it's finally boot season here in NC. After months of 90+ degree weather, we are just starting to feel some cool weather. I couldn't have timed this post any better as Fall literally arrived this past weekend. While I love sewing for any season, Fall always brings an oxymoron of rich, yet muted colors; colors of harvest and of course, boots! 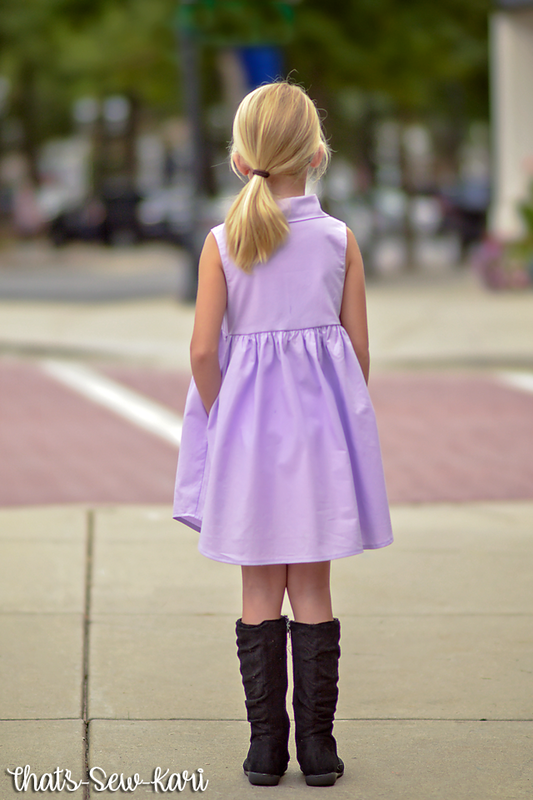 Boots and dresses are my favorite combo for my two daughters. 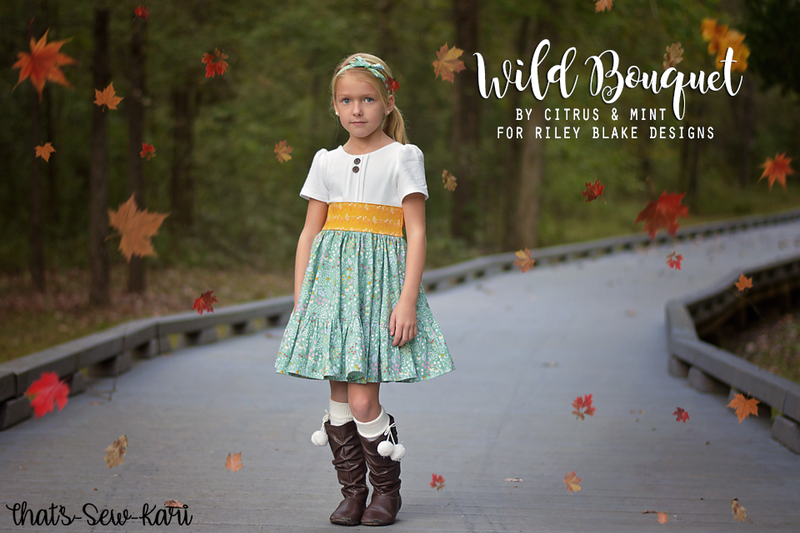 I was thrilled when I was invited to showcase Wild Bouquet by Citrus & Mint for Riley Blake Designs. 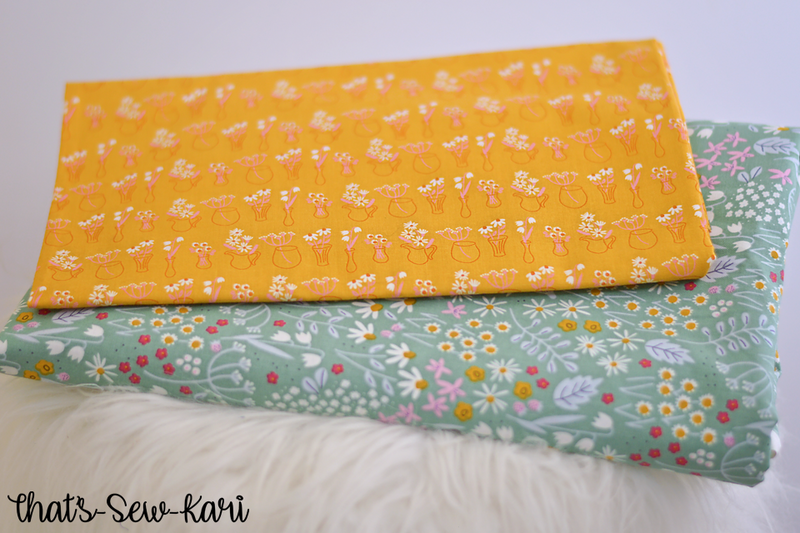 The fabrics are so pretty and are filled with gorgeous Fall-inspired florals. The color palette is merlot, navy, mustard and green. There are also coordinates of pink, cream and pastel blue. I knew the Wimberley Dress by Little Lizard King was the perfect pattern to showcase these beauties. This is the third one I've sewn (a sure sign I love the pattern!) and I went with most of the bells and whistles the pattern offers. I haven't even sewn the extra twirly version so I knew I had to try it out. 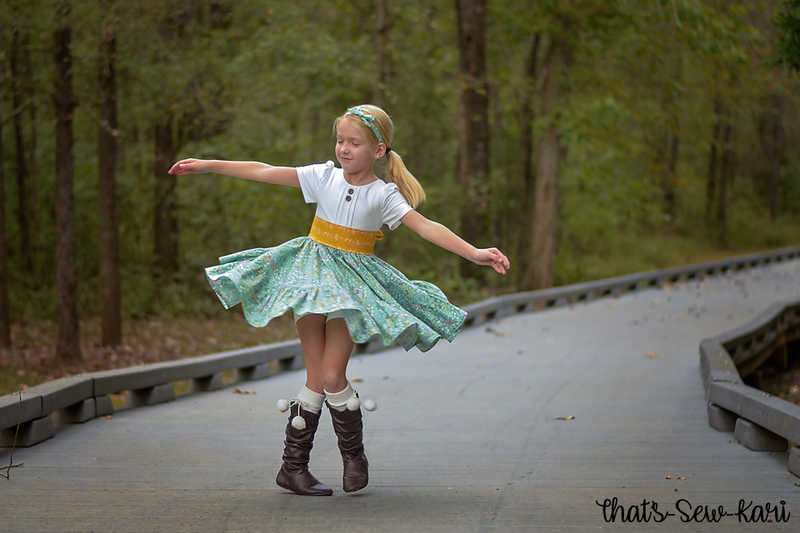 I loved the smaller scale of the wildflower print for this twirly skirt. None of the details of the print are lost. P.S. With 17 feet of ruffle to hem and gather, I really spent some time admiring the print! The sash is optional, but I love the pop of color the mustard brings here. I used some scraps for a coordinating headband. This picture also shows the print of the Wild Bouquet Vases (mustard). Of course, Miss 7 had to test the twirlability!! 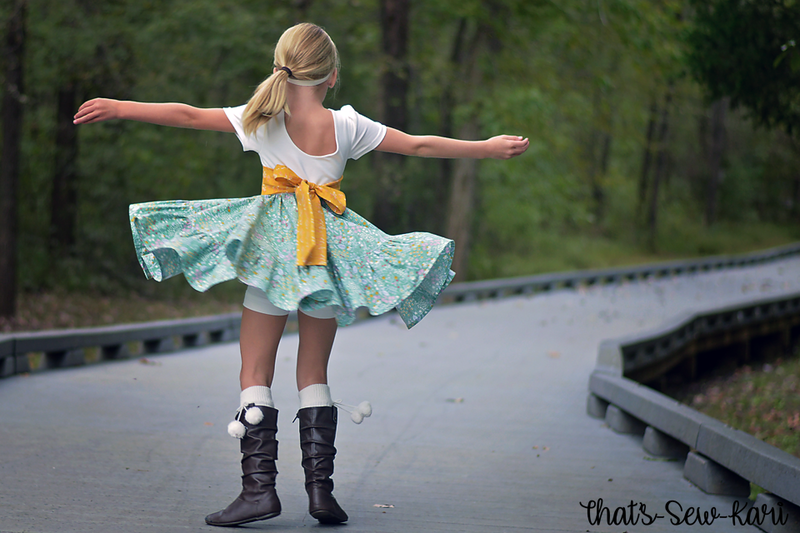 She twirled herself silly! Luckily I had the hindsight to sew up some New Haven Shorts by Little Lizard King. Not only are they practical, but the cuffed legs are cute to boot!! Be sure to head to Riley Blake Designs to view the entire collection. Come back and comment with what fabrics catch your eye. Bonus points if you have a pattern in mind too for them. Little Lizard King has been part of my girls' wardrobe since they were itty-bitty. My youngest was just two years old when she started modeling my creations. Now, she's 7 and still loves to see what the next LLK creation will be. 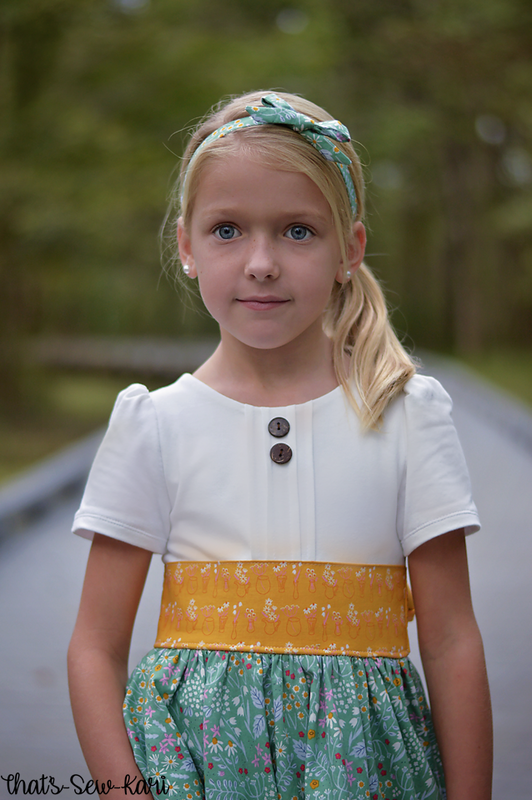 I am humbled to be a part of the LLK family and excited to share one of the latest patterns (stay tuned for more). 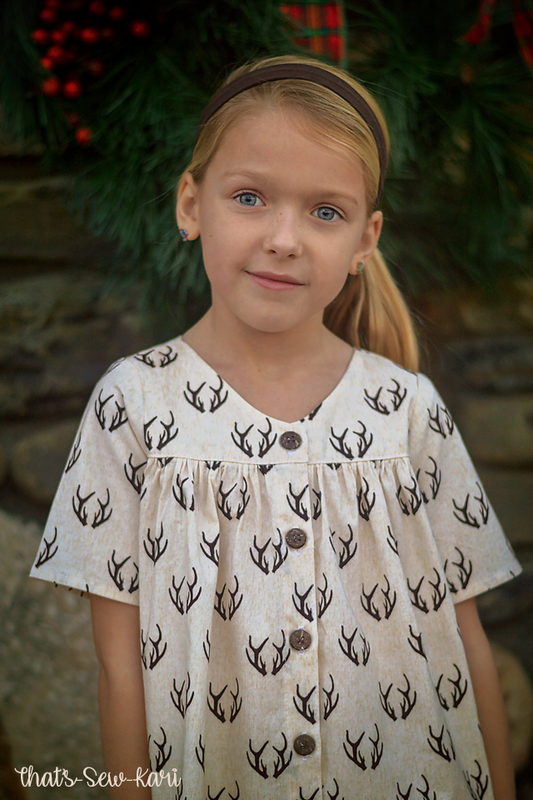 The Westport Top & Dress is a classic, collared button-down style dress with 4 different sleeves (sleeveless, flutter, puffy short, and classic long). The skirt bottom features the arched sides like you'd find on a dress shirt. 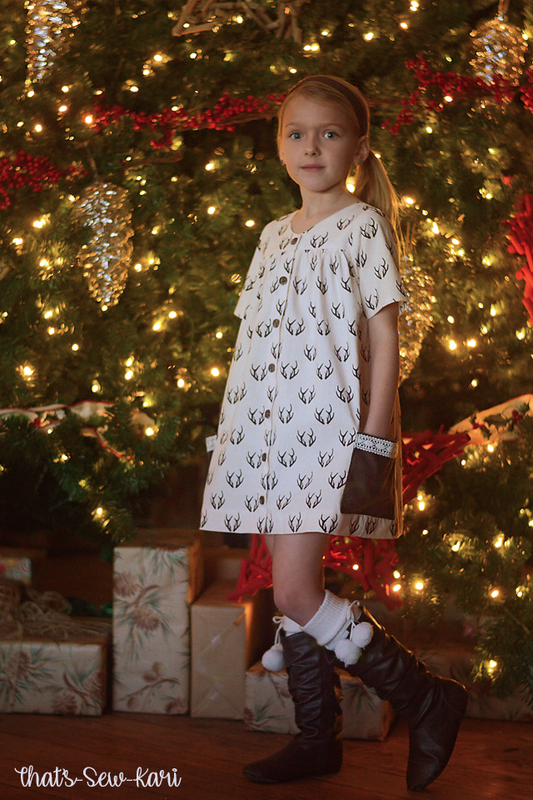 The sizes cover 12m - 14 girls. Even though we have entered the season of Fall, our weather hasn't gotten the memo. It's still in the 90s everyday so I chose to sew up the sleeveless version because who knows when Fall will come. This dress is not super fitted in the bodice, but it was easy to put on despite the short placket. Did I forget to mention P O C K E T S ? Ohhhh, yeah!!! I definitely said yes to those! 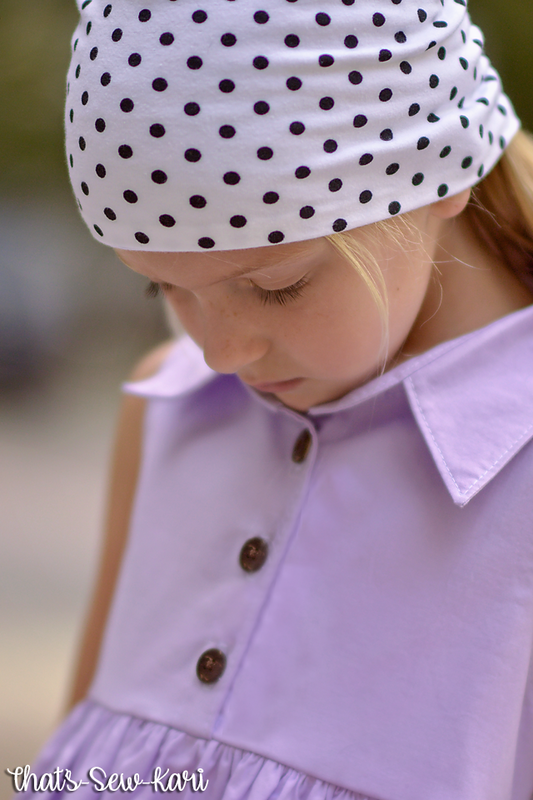 If you've never sewn a collar before, this one is simple and straighforward. It features a both collar stand and a collar. 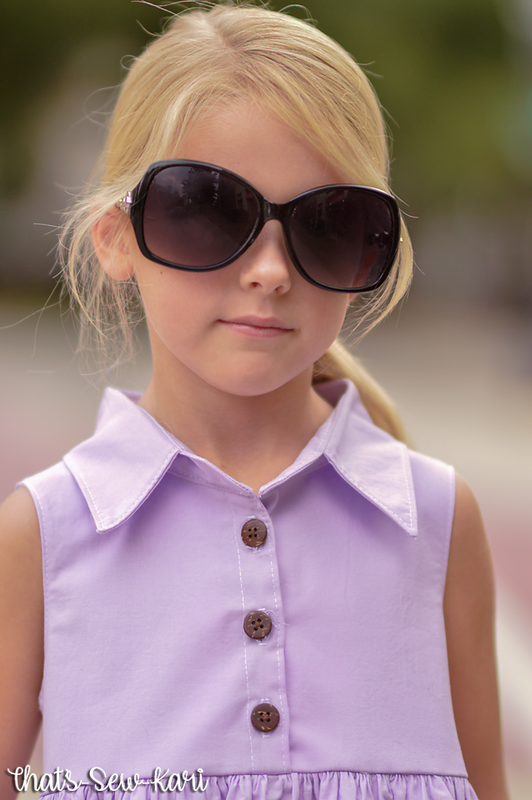 If blending sizes, it's recommended to leave the neckline unblended and cut for the height of the child. This way you can be certain the collar stand will fit perfectly. 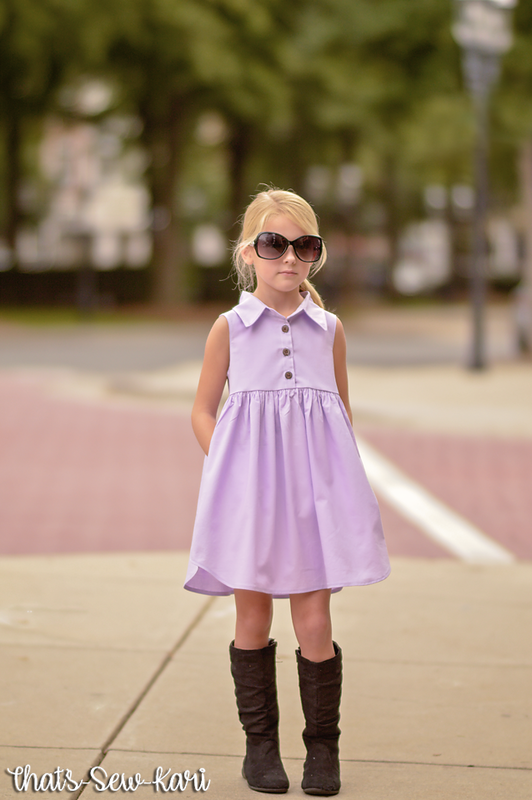 My daughter is wearing a 4 width and 6 height and a straight 6 collar. I've styled it fairly simply for my photoshoot -- tall boots and oversized sunglasses for some pictures and then we swapped out the glasses for a Seattle Beanie for a more urban, hipster vibe. The Seattle takes just minutes to sew up, especially once you don't have to consult the tutorial. I had originally picked out a smaller print on the knit for the beanie, but I was just 2" short in width so I decided polka dots for Plan B.
P.S... this pattern is O N S A L E for one last day so hurry to the shop to snap it up at 30% off! Oh my gosh!!! Last summer, I fell in love with Cricut products when I first got my Explore Air 2. Then, I got my Maker and an EasyPress. 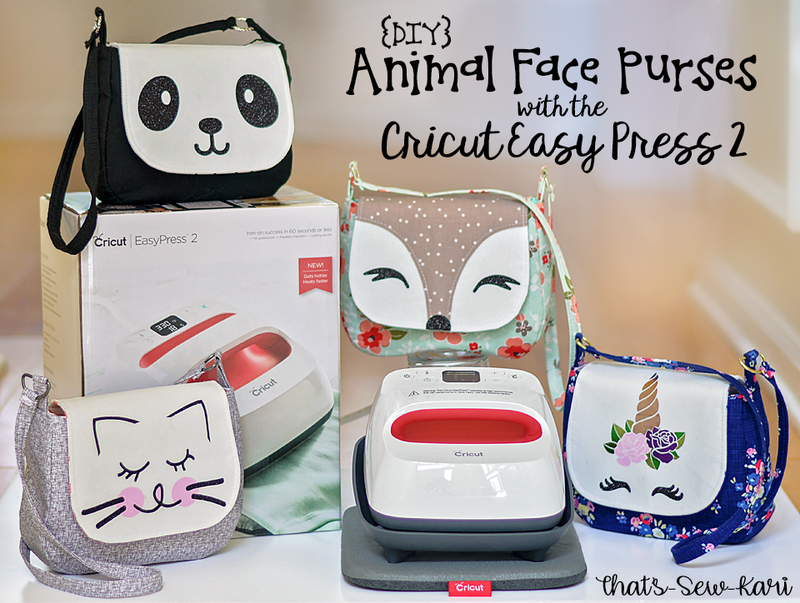 Today, I am so excited to share with y'all the newest product to the Cricut Family -- the EasyPress 2! The EasyPress 2 now comes in 3(!) sizes and features a gorgeous raspberry color. The sizes include 6x7, 9x9 and 12x10. 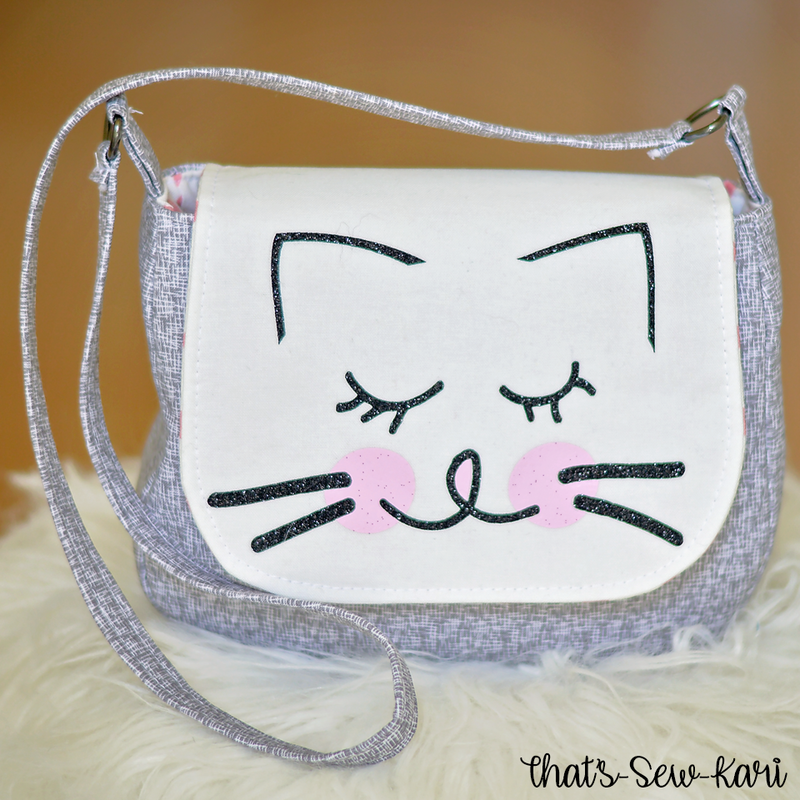 It's so easy to learn and like all the other Cricut products, includes a quick practice project to build your confidence! The heat plate is ceramic-coated and boasts a dry, even heat for a perfect transfer every single time. It will give you professional iron-on success in less than a minute! 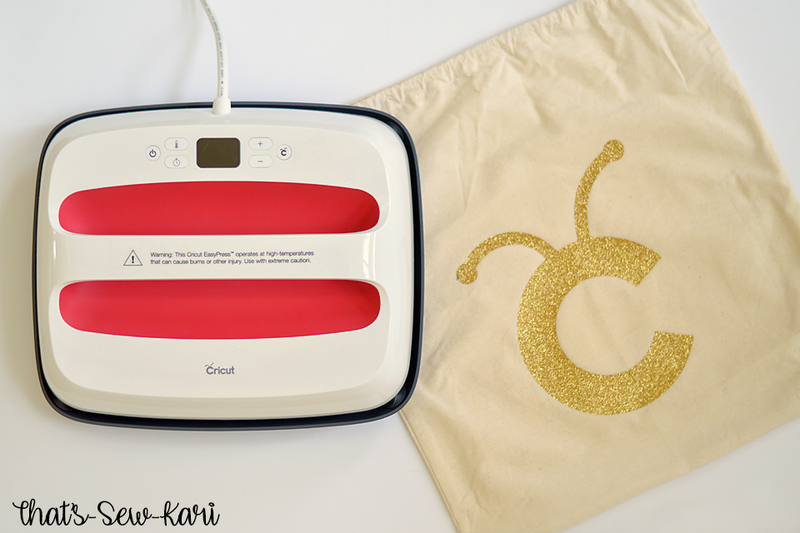 It heats up very quickly and has precise temperature control up to 400 F. Visit Cricut's interactive PDF to see the perfect temperature for your project! The EasyPress 2 also comes with its own safety base with keeps your press in a protected resting position and also keeps your crafting area safe. Last, but certainly not least (! 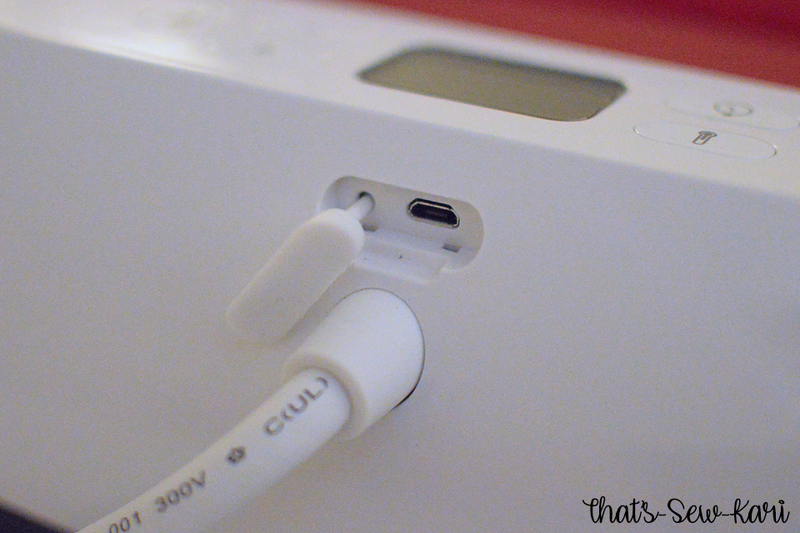 ), it has a USB port for firmware updates. When you open the project, click customize in case you need to resize to fit your project. Once the size is correct, click MAKE. 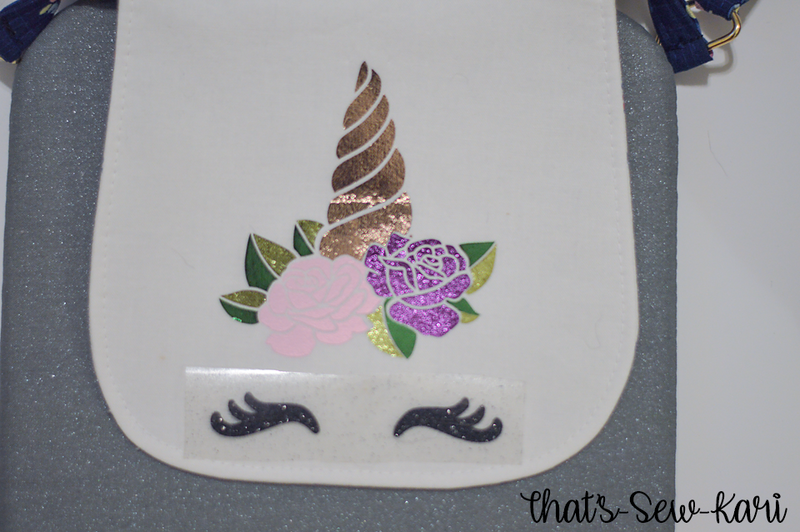 Prepare your mat with Black Glitter Iron-on, shiny side down. Double check you have selected "Mirror Image". Cut file, and weed. Press ON and select temperature. (To determine the correct temperature and time for your project, CLICK HERE). Place your project on the Easy Press Mat, flat. 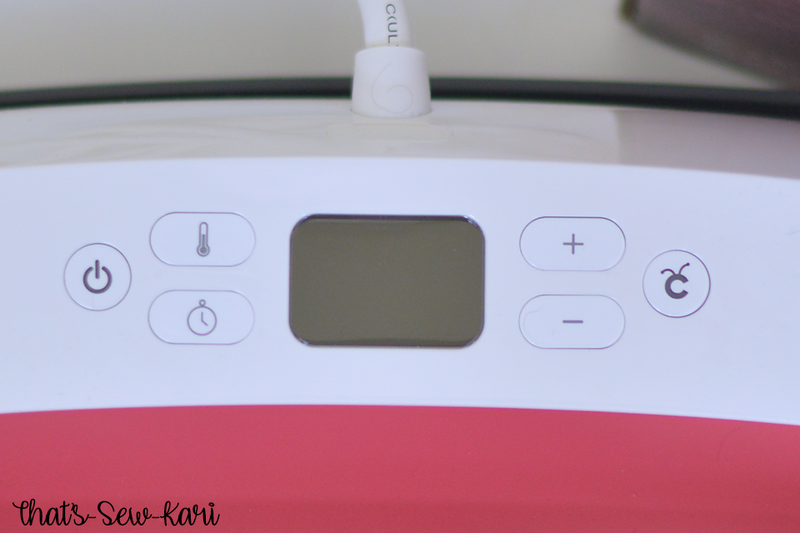 Once the EasyPress 2 is heated and pressing time is selected, preheat your fabric for 5 seconds. Place PANDA FACE in place with shiny side up. 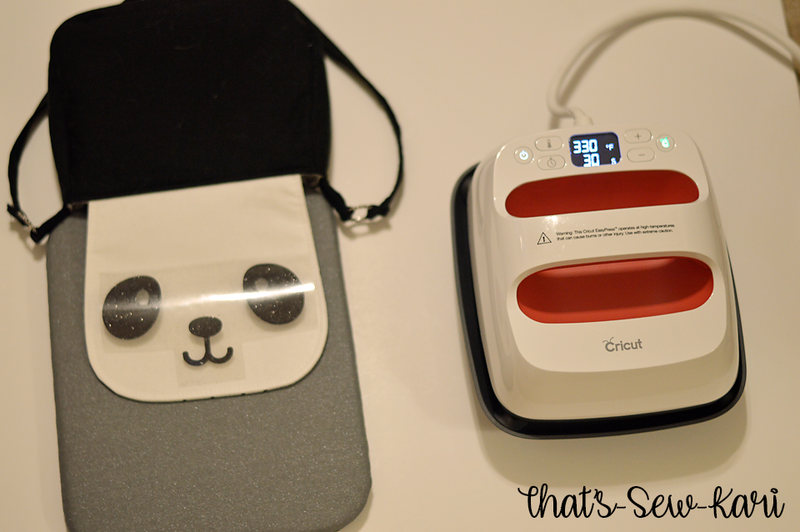 Place Cricut Iron-on Protective Sheet on top and press START to begin the timer. 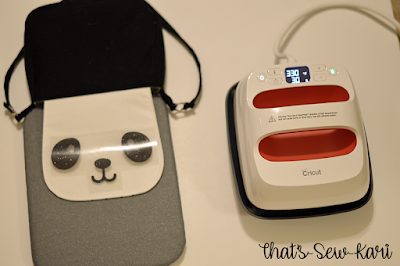 Apply heat + gentle pressure using your EasyPress 2. Flip project over and press for an additional 15 seconds. Peel (hot or cold) according to iron-on instructions. *Note: This photograph was taken while the timer was counting down! Press ON and select temperature. (To determine the correct temperature and time for your project, CLICK HERE). Place your project on the Easy Press Mat, flat. Once the EasyPress 2 is heated and pressing time is selected, preheat your fabric for 5 seconds. Place FOX FACE in place with shiny side up. 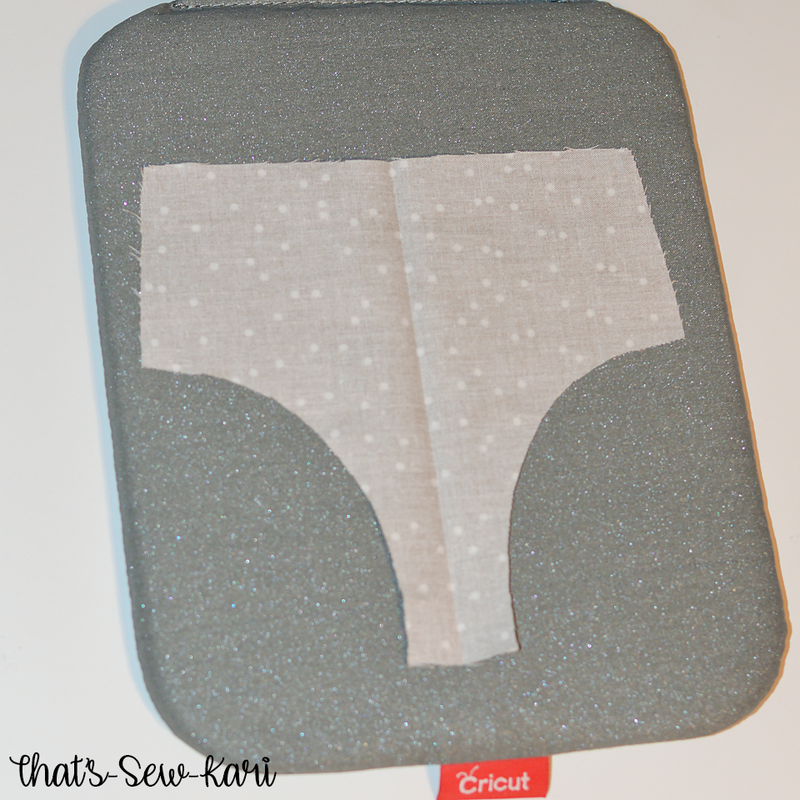 *** To add the contrasting fabric, do these steps PRIOR to sewing the pattern: fold your pattern piece in half. Starting 5/8" from the middle fold at the bottom, cut a curve to mimic half of a fox face. Unfold, if you're happy with your new piece, cut from fabric. Place wrong side up and press a 1/4" hem along the curved edges only. Pin in place on your main fabric and topstitch along the folded, curved edges. Proceed with pattern. When you open the project, click customize in case you need to resize to fit your project. Once the size is correct, click MAKE. 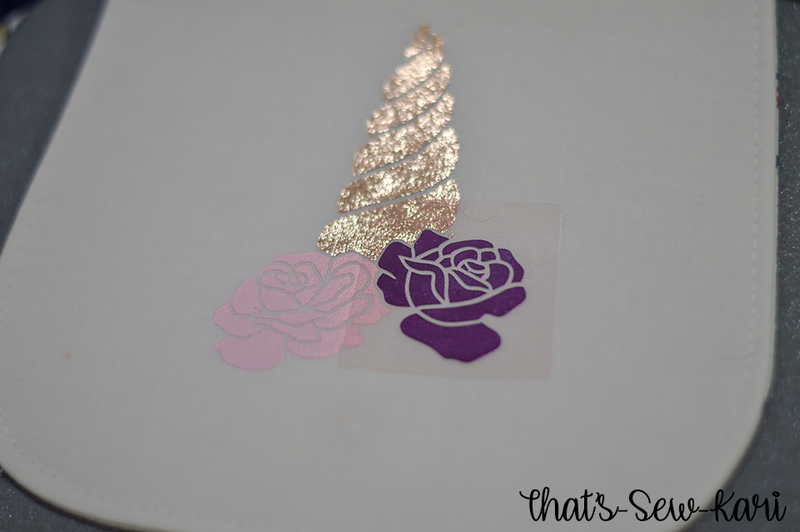 Prepare your mats with Black Glitter Iron-on and Pink Blush Iron-on Lite, shiny side down. Double check you have selected "Mirror Image". Cut file, and weed. Place Cricut Iron-on Protective Sheet on top of the Pink layer only and press START to begin the timer. Apply heat + gentle pressure using your EasyPress 2. Flip project over and press for an additional 15 seconds. Peel (hot or cold) according to iron-on instructions. When you open the project, click customize in case you need to resize to fit your project. Once the size is correct, click MAKE. Prepare your mats with all 6 colors, shiny side down. Double check you have selected "Mirror Image". When switching between cutting materials, be certain to edit on screen before cutting an alternate material. Cut file, and weed. Repeat process for the remaining 5 layers. Build layer by later, beginning with the flowers*. 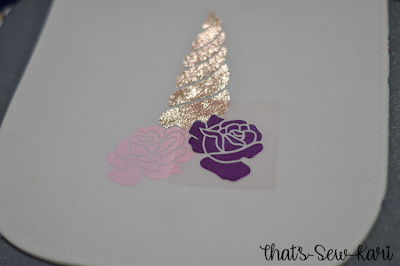 Foil Iron-on is cold peel. Allow item to cool first. After you have pressed all 5 layers of the unicorn horn, place eyes and repeat process. That's it!!! Now you can create your own animal cuteness! I plan on putting these on some shirts for my girls too! 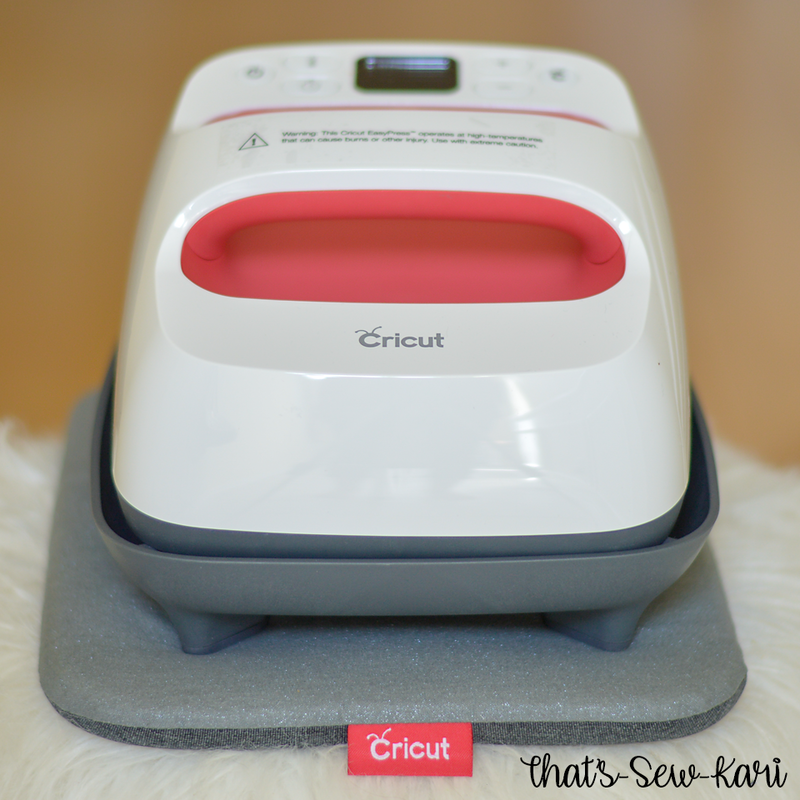 What I love about Cricut is they really stand behind their product and create with intention. The EasyPress 2 is no exception to this philosophy. They have the StrongBond Guarantee on many of their iron-on materials. Everyday, SportFlex and Glitter Iron on are designed to outlast 50+ wash and dry cycles when used and applied as directed!! Be sure to look for the StrongBond Guarantee!